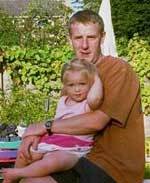 Mr David James Wright, a graduate of London University, lives in Abergavenny, South Wales, self-employed. He kindly agreed to answer our questions. Some Russians think that the main food of an Englishman is porridge. What do the British eat, in fact? The British diet has a bad reputation. It seemed that in stark contrast to our close European neighbours we were indifferent to what we ate. The French famous throughout the world for their excellent cuisine1, the Germans with their smoked meats and hams, the Italians with their herbs and olive oil. Whereas the British had mastered the art of the sandwich (preferably cheese and pickle2 with stale white bread). Somewhere along the way British people took the choice of convenience over taste. Whereas the French consider it normal to spend half the day preparing a single meal the British chose the delights of the deep fat fryer3 and the oven ready meal4. I think the main problem with modern British food is our over dependence on processed food5. Our supermarket shelves are packed with ready-meals, frozen portions of fish covered in frozen sauce with a few frozen peas on the side. The fresh fruit and vegetable section of the supermarket is passed by almost unnoticed6 chicken pieces made from “reformed7 chicken”, covered with bread-crumbs and oven chips8 made from “reformed potato” this is the basis of the British diet. Vegetables either come out of a tin9 or the freezer10 and there is no taste left in them either way. There have been moves to reform the situation. In the 1950s an intelligent lady called Elizabeth David went off travelling around Europe and noticed that they ate some jolly11 decent12 meals over there. She came home to England and wrote it all down in a book called something like “French Cooking”. This book introduced the idea of using such things as garlic, olive oil and herbs like basil13 and oregano14. These ideas were as revolutionary to British cuisine as had been the introduction of the potato all those years before. Unfortunately unlike the ubiquitous15 potato this revolution was limited to the upper and middle classes where “Mediterranean” food became the fashionable thing. With the exception of the pizza (frozen), the average British diet was left pretty much unaffected by the Mediterranean revolution. The next chance of improvement of the beleaguered16 British diet came in the form of another British passion – television. It became very popular pastime of the British folk to sit down of an evening to watch on television a series of talented and respected chefs17 spend some quite considerable time preparing lavish18 and imaginative19 dishes. This was best done while eating a bag of chips, so as to stave off20 any hunger induced by watching real food being prepared. Television chefs became celebrities; at Christmas everybody would buy their books to give to each other. Not many people ever read the books unfortunately but they had some great pictures of food in them. To give you an idea of how bad British cooking still is let me tell you about one of these T.V. chefs, Delia Smith. Now Delia Smith is a great cook and she knows a lot about food. 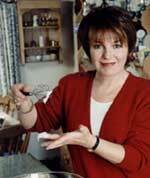 Over the last 20 years or so Delia has been on the television telling us how to cook great food. She has written some great cookbooks which have been hugely popular; almost every house in the country has probably got one of her books. Well, a couple of years ago Delia was starting a new television series to coincide21 with her new book, the title of both was “How to cook”. In the book and on television she now explained, in great detail, how to boil an egg, and how to make a piece of toast. Poor Delia had been telling the British public how to cook for over 20 years and she had now realised that she needed to go a bit slower as the British public had not been keeping up with her as well as she had obviously hoped. And Delia was right; the British public hadn’t really being paying much attention all those years after all. I think the problem is the British just aren’t that interested in cooking food. We realise that other people do it better; if you want a posh22 meal you go to a French restaurant. This explains the success of the multicultural take-away industry23, we know we can’t cook a curry24 as well as the Indians; the Chinese make better Chinese food. And besides, if you are ever at an English seaside town in the early evening, just as it is starting to get cold, and you’ve just spent the day at the beach and you’ve been to the funfair25, you will find that a big portion of fish and chips with plenty of salt and vinegar will taste like the best meal you have ever eaten. Elizabeth David (1913 -1992) was brought up in an outwardly idyllic seventeenth-century Sussex farmhouse, Wootton Manor, and her interest in cooking may well have been a response to the less-than-stellar1 meals on offer there. During World War II she lived in France, Italy, Greece, and Egypt (where she worked for the Ministry of Information), and spent much of her time researching and cooking local fare2. On her return to London in 1946, David began to write cooking articles, and in 1949 the publisher John Lehmann offered her a hundred-pound advance for A Book of Mediterranean Food. When it came out the following year, it proved a revelation to Anglo-Saxon appetites. Summer Cooking (1955) consolidated her position as the foremost food writer of her day. David continued to be a student of her art throughout her life. Elizabeth David was awarded a CBE3 and — the honor that pleased her most — elected a Fellow of the Royal Society of Literature. Delia’s simple style of teaching has changed attitudes to cookery in the UK. Anyone who follows a Delia recipe can do so with confidence, and her ability to increase the sales of ingredients by a simple mention is legendary. At 16 Delia left school with no qualifications and worked as a trainee hairdresser, then she became a shop assistant and later worked for a travel agency. At the age of 21, a time washing up in a restaurant pointed her in the direction of cookery. Studying English cookery books in the British Museum inspired her to try out recipes, cooking for family and friends. In 1969 Delia became cookery writer on the Mirror and later wrote for London’s Evening Standard. One of her first television experiences was as an assistant on a TV food ad. When someone dropped a pie just before filming began, she stepped in saying she could make that. When she presented her first series for BBC1, home cooking was declining as people were turning to takeaways, supermarkets and the novelty of ready-meals. Delia wanted to run basic television cookery courses to revive enthusiasm for home cooking. When her Cookery Course was broadcast, accompanied by back-up books, it was an instant success. Away from cooking, Delia’s great passion is football. Taking a very active interest in Norwich City FC as she is a director of the club.